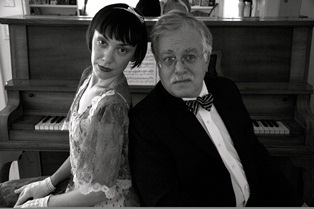 “An Evening with Van Dyke Parks” will be presented on the Library Community Room “Carnegie Stage” on Wednesday, February 27 at 7 PM. The concert, part of the City of South Pasadena’s 125th Birthday Celebration, will be presented by the South Pasadena Public Library, the Friends of the South Pasadena Public Library, and the Mike Kelley Foundation for the Arts, an organization launched by the world famous artist who passed away at his home in South Pasadena last year. The Community Room, the original 1907 main reading room of South Pasadena’s original Carnegie Library, retains its historic hand-painted beam ceilings, leaded glass windows, and wrought iron and glass main doors. It is now ADA compliant as well, with a new wheelchair ramp. The concert will be a fundraiser for the Friends of the South Pasadena Public Library who will also provide refreshments. As so many know, Van Dyke Parks is a legendary composer, arranger, producer, musician, singer, author and actor who is probably best known for his collaborations with Brian Wilson and the Beach Boys, including the famed SMiLE album, finally released in 2012 to critical and popular raves. Van Dyke Parks is also an established solo act and during his extraordinary 40+ year career, he has collaborated with such artists as Phil Ochs, The Byrds, U2, Rufus Wainwright, Harry Nilsson, Ry Cooder, Bonnie Raitt, Randy Newman, Fleet Foxes, Keith Moon, Frank Zappa, and Ringo Starr. He has also released six acclaimed studio albums, as well as a distinguished live album. For the concert Van Dyke will be singing and playing the piano and accompanied by his stellar band comprised of harpist Amy Shulman Kent, cellist Cameron Stone, Dave Stone on standup bass, and percussionist Don Heffington. They will be joined by very special guest artists, Inara George, Joe Henry, and David Plenn. Tickets can be purchased for $20 each at http://vandykeparks.eventbrite.com. Doors will open at 6:30 p.m. At the conclusion of the concert, autographed Van Dyke Parks CDs, 45s, and LPs will be available for purchase. Ample free parking for concertgoers will be available across the street from the Community Room at 1020 El Centro Street, thanks to generous support of the South Pasadena Unified School District. Audience members are asked to enter the parking lot on the west side of Fairview Avenue, just north of El Centro. It is not known at press time if any tickets will still be available at the door on the night of the event. Special thanks are due to Bob McClain and S & B Sound, Scott Gandell and Anneline De Croos/South Pasadena Mercantile, Bob Stane/Coffee Gallery Backstage, and the Restoration Concert Committee of the Friends of the South Pasadena Public Library.